Today, as fall rustles through leaves that threaten to change, I feel as classic as ever. I’ve borrowed some stripes from Paris but coupled them with my American classic: the charcoal hi-top chuck. It may have taken a little globe-trotting to discover that the classics actually reside in my own backyard, and I may be adding a little pumpkin spice to my latte (thanks, Frothy Monkey! ), but the truth remains: I am an American classic. Well, it’s official: my family carries a dominant Converse gene. I knew that my immediate family had a chucking addiction, populating the closets of Arizona, New York, Tennessee, and Rhode Island, but now it seems that we’ve extended our reach to Texas. I now spend my days alone at the store (Tuesday, Friday, and Sunday for those of you taking note and planning a visit) reconnecting with my dear Aunt Susie. 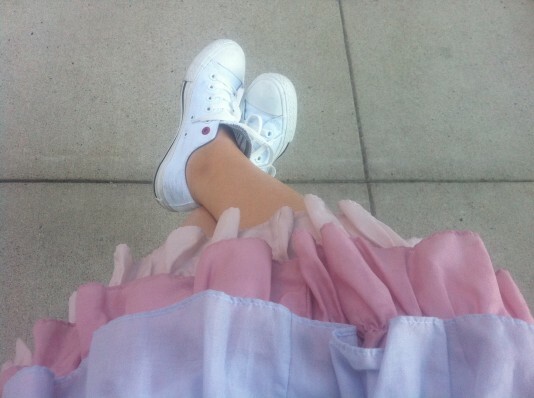 We email pictures, outfit my cousin Leah, and chat about life and the love of chucks. While I love serving you, Nashville, it brings a particular joy to my heart to pack up a box of my faves to ship off to my family. And when they send back all-star pictures like this, that makes the whole journey worth it. Yes, I know that it’s 90 degrees outside. The calendar, however, tells me that today we fall, and I plan to listen to him. Here’s my dark secret, Nashville: I love to fall. I love scarves and layers and chills and plaids and walks through leaves. Fall has a transporting power. It takes me back to Yale, back to Gothic architecture and collegiate angst, back to subway rides through Manhattan that would get me to where I needed to go with enough time to stop for morning coffee, back to that coffee itself, perhaps infused with a little seasonal nutmeg and spice. Regardless of where I am or how nostalgic I may be, fall is a time for fresh starts. It’s a time to change colors and drift into playful exploration. As such, I’ve chosen the sycamore hi-tops today, because no matter how it feels outside, today is fall. So, I will grab a cardigan when I leave the house. I will throw on the Steven Alan striped scarf. 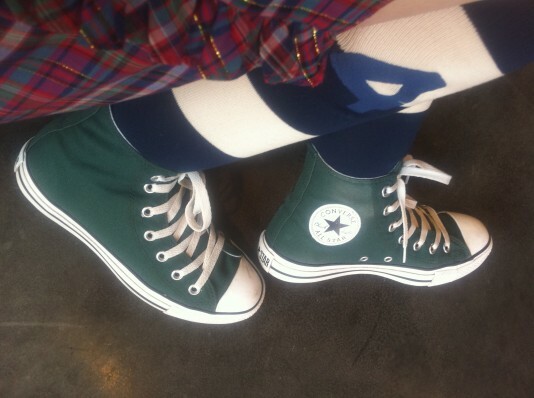 I will layer socks under my sycamore Chucks. On a white day, we take a moment for quiet reflection. We think of the times that have passed and those that are still to come. We cleanse, we purify, and we seek to do better than we’ve done. For me, a day of white reflection brings me closer to my family. In a time of twists and turns, I am blessed with a family whose love and support is constant and strong. I built this wonderland to bring joy to my fellow travelers, and I am so pleased that my family has given me the opportunity to share that joy with them. Likewise, this has been a year in which a dream team emerged in the 2L staff. Stephen, Ricky, and Becca make work days a pleasure and keep me from taking days off simply because I want to see them. Thank you, day of white, for reminding me who my loved ones are, what my wonderland is, and how to find my smile everyday. Fall can be a gloomy time. Before there’s even a chill in the air, the sky looks grey enough for us to wrap a scarf around our neck when we leave the house. We’ve traded in shining suns for falling leaves, and even if we’re not going back to school, we still find ourselves gravitating toward fall’s moody hues. So, here’s a suggestion: aster purple. 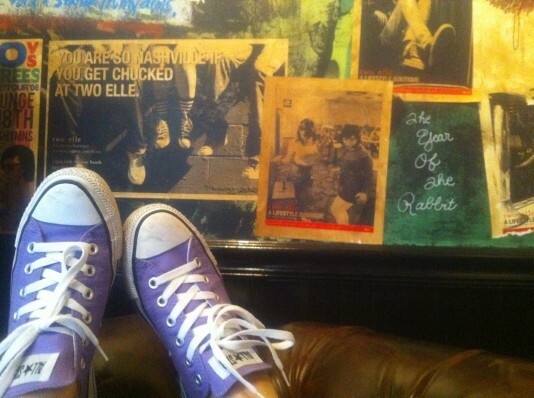 Rachel decided to combat fall blues this morning with aster purple chucks. And it worked. 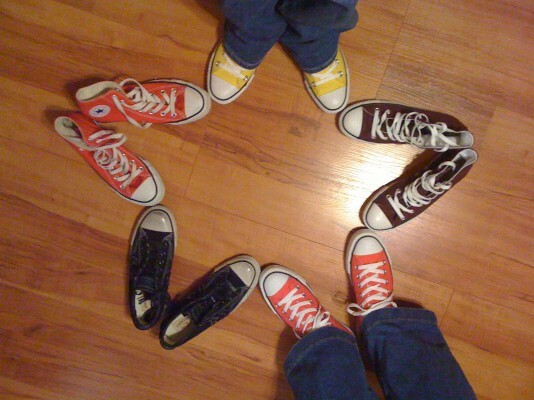 As it’s our favorite season of the year, we’re ready to fall, but we find that a classic pair of chucks ensures that we’ll always land on our feet.